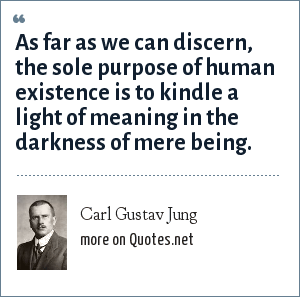 Carl Gustav Jung: As far as we can discern, the sole purpose of human existence is to kindle a light of meaning in the darkness of mere being. "Carl Gustav Jung Quotes." Quotes.net. STANDS4 LLC, 2019. Web. 24 Apr. 2019. <https://www.quotes.net/quote/14613>.